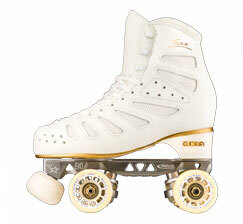 EDEA Passport – Skates U.S. 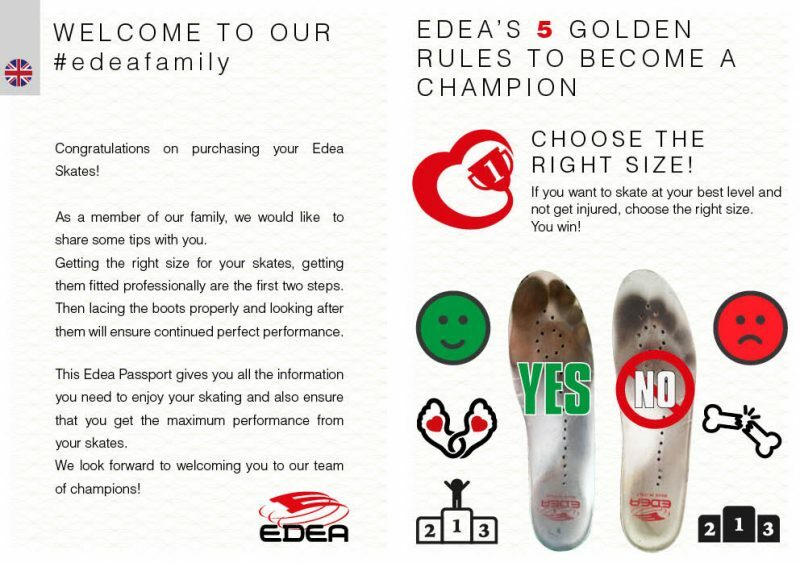 The Edea Family gets the Edea passport! 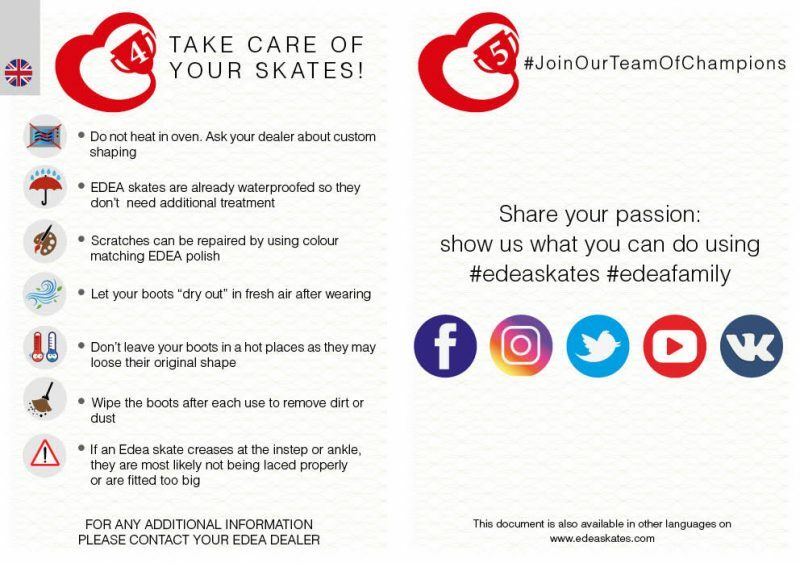 We created this passport to educate our consumers when choosing their skates in an effort to avoid poor choices that result in problems. Download a PDF copy of the passport here. 1. What is this passport? As you may know, Edea is concerned about the safety of our customers and the good utilization of our products. 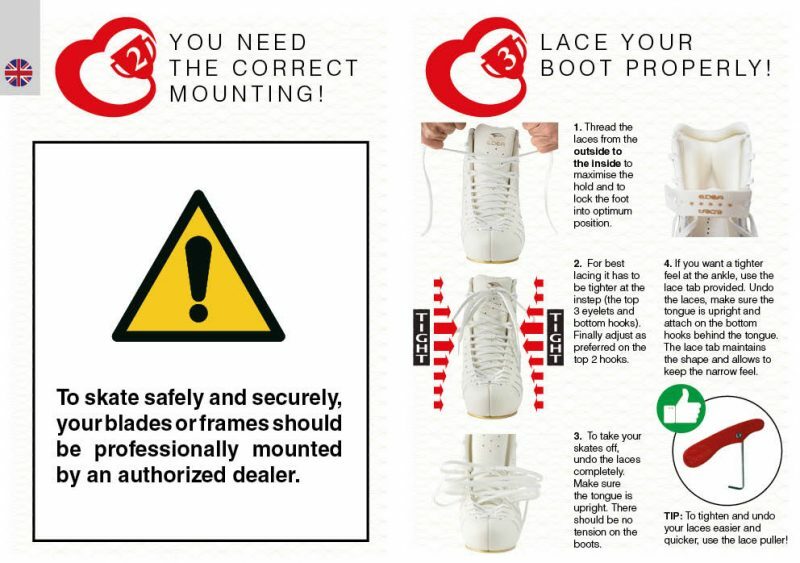 Our main complaints and returns are usually due to boots that are too big or not laced properly which have an impact on both the skaters and our skates. 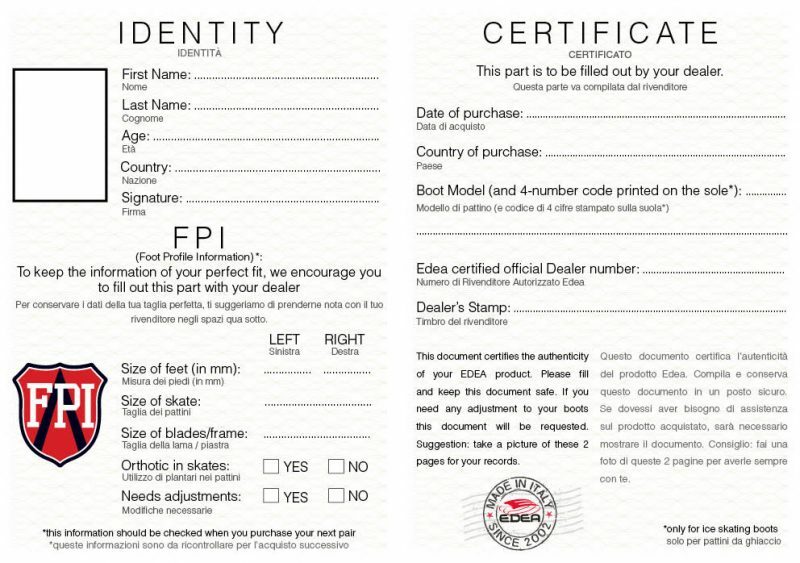 This passport contains important information to ensure the maximum performance from our skates and certifies the authenticity of the EDEA product. It needs to be completed by a certified and authorized Edea dealer exclusively. This document is a red leaflet of 16 pages in English and Italian that resembles a real passport. It is also available in other languages online. Please complete the first page of the passport called “FPI” with the consumer during the purchase. The foot size should be measured with the Edea measuring device. Then YOU will finish the certificate side. (on the right) For this part, you will enter your special Edea Registration dealer number. Some recent purchasers might want a certificate. The passport is available to be downloaded here so all your customers can have it even if they have already bought their boots. You can issue the certificates if they have a valid receipt and have been lacing correctly! 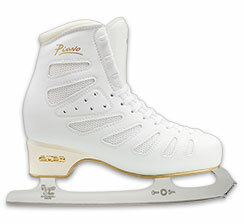 (check the boots) On hand stock that don’t have a passport, simply contact info@edeaskates.com and we’ll send you the passports required with your next order. 4. How do you get your Authorized dealer number? 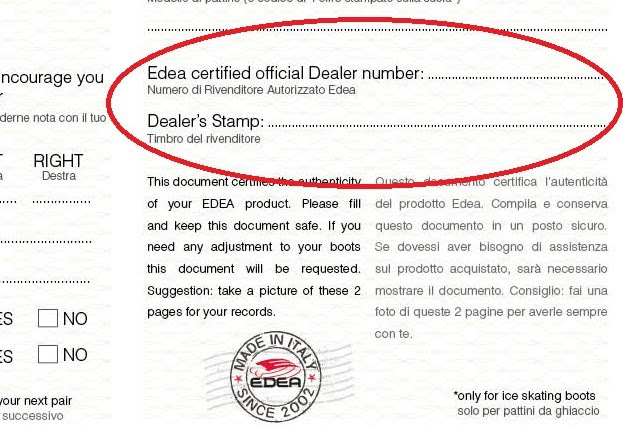 You will receive your Edea registration number by e-mail on a certificate issued to you that attests your Edea Authorized Dealership. 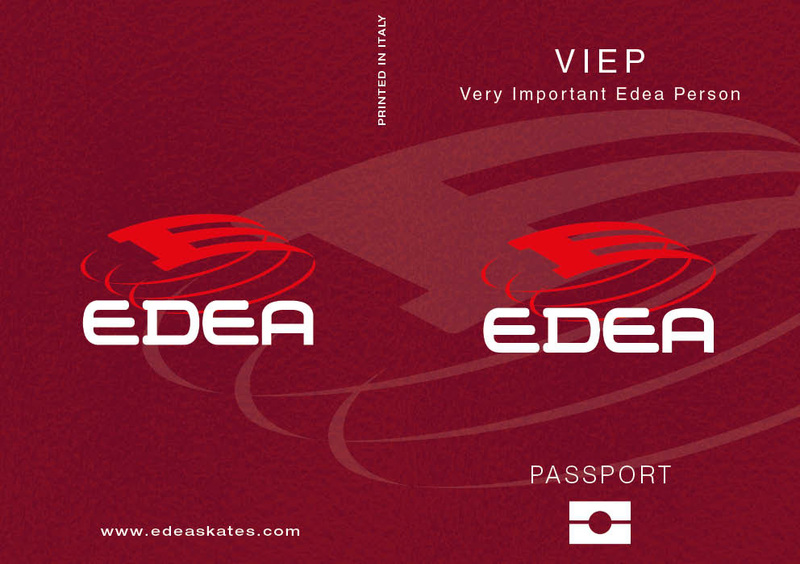 Edea starts to include Edea Passport in each box. You can request to have Edea Passport for the boots you have in stock. 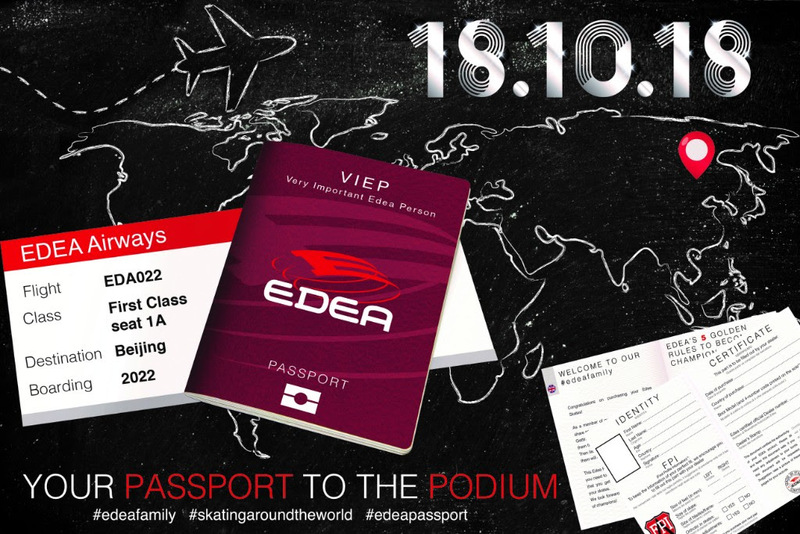 Edea starts the promotion of Edea Passport on social media, giving our dealers time to get familiar with it.